darktiste: Excellent input, thank you! I'll try to keep these things in mind for future illustrations. Any feedback is always welcome as always! 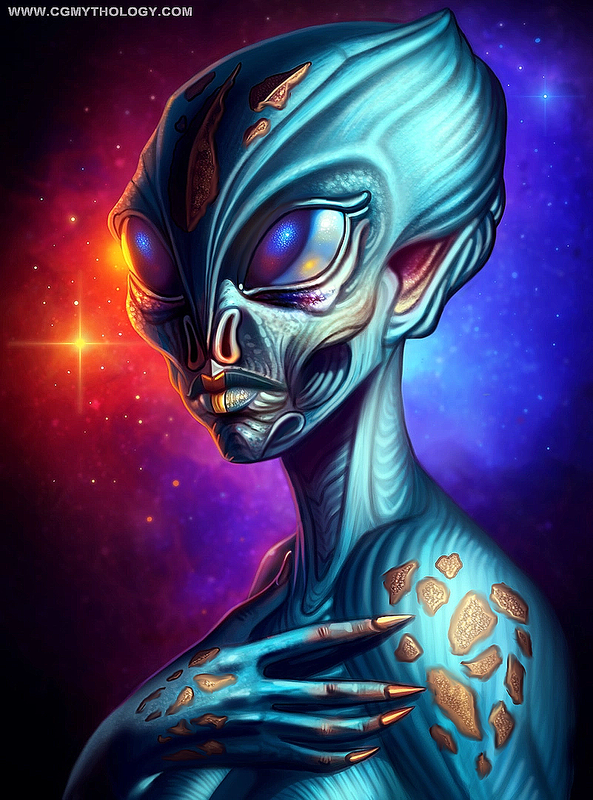 I began painting the alien with magenta tones and didn't like the results, so I ended up repainting it again. The colors were very challenging in this piece, probably because I'm not used to painting Alien skin tones, so this was a welcome challenge. I worked on the image a great deal, pretty pleased with how it's turning out so far. Feedback welcome as always! Well the biggest issue is all of your edges are hard, you tried to add a blur effect to the left side but it still reads as a hard edge. the way the brush strokes on the right side of his head, his cranial area do not follow the form of the "skull" i assume he has. Your strokes go concave and flatten the shape of his head, so try to wrap the strokes "around" his head, think like how the skin wraps around an onion. Might redo that piece soon, i really like the pallette and coposition, its just im more aware of the anatomy problems as years go by. Fedodika: Great input regarding the brushwork and edges. I worked on the image and tried to implement your input, although I'll be more conscious of this in future works as it's a bit too developed now. I really enjoy the image you posted as well, some very strong brushwork there, had a very traditional feel which I enjoy. Fedodika: Excellent feedback, as always. I applied the technique you mentioned, albeit very subtly as I prefer a more crisp look than a blurry one, but I'll definitely keep what you said in mind when handling depth of field for future illustrations. Why are some of the element not blending with tht rest as if they where not meant to be on the same image?Great rendering btw but i think you want to fix black border that make your thing both comic and realistic with those dark edge that make it look out of place.Here what mine would have look like.Of course with bit more accuracy on the smudging job you could get better result but it give you an idea.I also have run a sharpen to bring out the texture inside those strange scale like shape. darktiste: Thanks for you input. Thanks for taking the time to post the paintover as well, interesting results although some parts appear much too sharp for my taste (I prefer a softer look for my work). 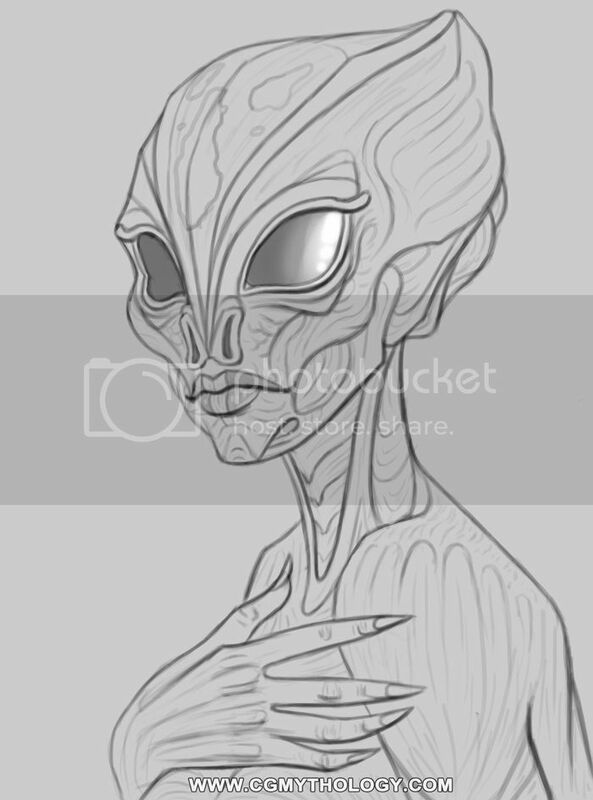 I think I'm done with the 'alien' image for now, although I plan on creating another one in the near future and applying all I learned from the input I received. Should be fun! i feel her lower hand is too small, and her other arm is an awkward pose. like, take that pose yourself, specially how close it is to the body, with a platebody, id move it out a lot more, particularly because i cant see how the bicep connects to it, maybe because you want to avoid that tanget that would happen if you drew it. For the face, you seem to be drawing it tilted up, and nose reflects that, but the eye to the right side should be higher, else it appears to be sagging off the center line. Id get reference for this pose if possible, its subtle, so all the more important to get right. The arm to the right side of screen, like this is the problem with drawing things in flat perspective, is you really need to nail the other perspectives to pull it off. So, the sword in her hand is a graphic shape basically, the hilt is not turning at all in space, which is possible, but considering the other hands, everything points to it tilting. The way the way the hands are place makes them feel close to the body, and it feels like the sword is against her chest plate, but i dont feel the volume of the chest plate, its like a flat shape that bends over the sword to accomodate the hands position. Fedodika: Thanks for your honest feedback as always. I did have a reference photo for the general pose which I tried to stay close to (I think there's a link to it on the original pose) so I think the pose itself looks fairly natural. Good point about the eye, will fix that as soon as I flatten the layers. The pose is a bit stiff as you mentioned, that's actually a common challenge for me to overcome with my drawings, so in the future I'll try to exaggerate the gesture more for a more dynamic result! Photobucket is acting weird again so I wasn't able to upload yesterday's and today's updates, so I'm attaching them directly in the forum. The image has come quite a long way and I did my best to incorporate all the great input I received. I think I'm gonna go for a bit of a darker and grittier feel for this image as I think it'll make it more believable, so I added some battle scars on her face and will add dirt/rust/etc. 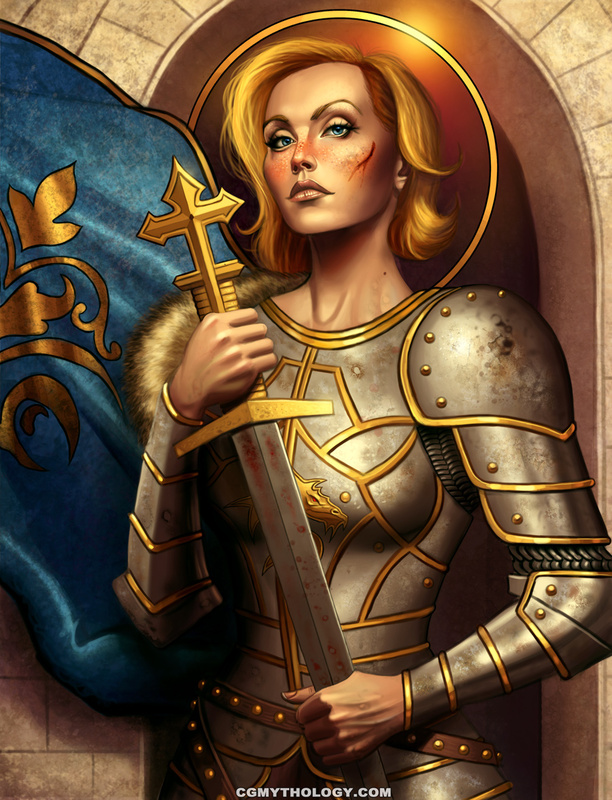 on her armor and sword. Below is yesterday's update followed by the more recent one. Feel free to let me know any feedback as always! I think if youre gonna make it gritty, like reaaally make it gritty, having a cut face and squeaky clean armor doesnt make sense, but i see youre gonna go for that. 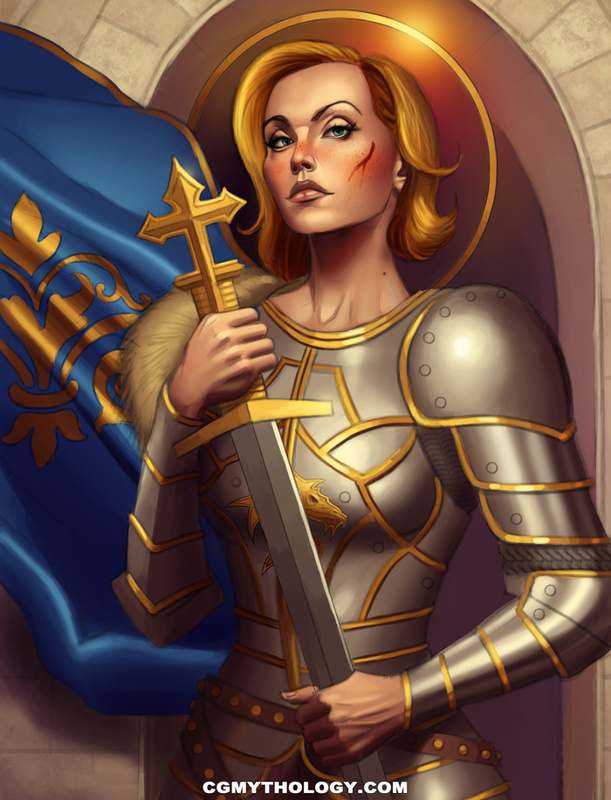 Fedodika: Yes, I was aware of that, just wasn't at that point where I applied the texture work to her armor! Finally had the chance to finalize this piece. I spent quite some time refining and doing a ton of detail and texture work to help bring it to life, so much so that I'm a bit exhausted from working on it, haha. Special thanks to everyone that took the time to provide feedback for this illustration, it was a great help and the image is that much better for it, so I'm very grateful! Just for next time - careful with how you render the sigil/pattern on the flag. You had it correct in your WIP with the shadows falling in the folds of the fabric, but in the final piece it's like the shadows are going in the opposite direction of the flag. Also, I know we've all been guilty of this, but if you're going to put a texture over something then you need to make it fit to the form. You can tell with the flag a static texture has been placed over it... it doesn't move with the flag like it should. A quick minute using the liquify or wrap tool would help. Last thing, there seems to be a bit of conflict with styles in the image. The face and hands have been fully rendered, but there's thick black line art throughout the armour and even behind her. This breaks the flow of the imagine and is something to keep in mind for you next piece.